On this Thanksgiving, it's customary to reflect and give thanks to the blessings in our lives. In my case, I'm certainly thankful the opportunity to be able to visit the Disneyland Resort regularly and capture the wonder and beauty that is Walt Disney's original theme park creation. And just as Walt asserted, with the continuation of imagination, the resort has evolved from one park to two, and many expansions and improvements along the way. 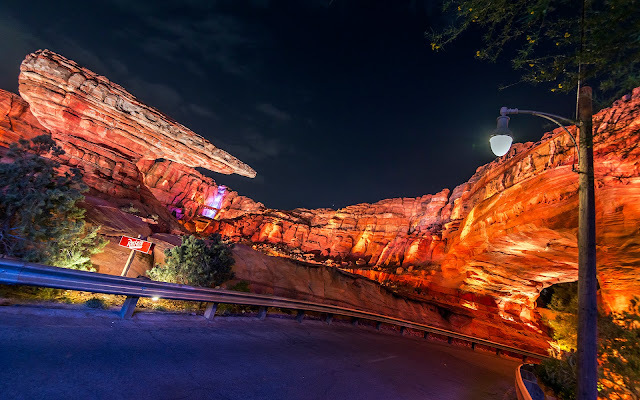 The latest, of course, is Cars Land--a shining example of world class Disney quality. To be able to stroll through such beauty is definitely a blessing and something I don't take for granted. It really doesn't get old, and I hope it never does. So happy Thanksgiving to all my readers, and give thanks. The holiday season is among us, so let us all appreciate and be grateful for what we have. Coasting along the monumental Ornament Valley is an experience full of grandeur!